WHY SHOULD YOU HAVE YOUR TAX RETURN PREPARED BY A PROFESSIONAL? An Enrolled Agent is a FEDERALLY AUTHORIZED TAX PRACTIONER with professional expertise in the field of taxation. Enrolled Agents are licensed by the United States Department of Treasury to represent clients before the IRS in situations of audits, collections and appeals. As an Enrolled Agent, I will assist you in the entire planning process to help you minimize the tax consequences of your decisions in your personal and business life. 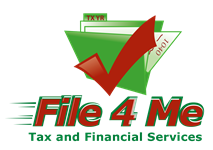 File 4 Me Tax and Financial Service, prepares both individual and corporate tax returns. Inadequately trained tax preparers can make costly errors and omissions that may result in hundreds and even thousands of dollars in lost refunds or unnecessarily higher taxes paid. Don't make that mistake. Find out more about Enrolled Agents.